He had been a relatively little-known fighter against the Soviets, in the Hizb-e-Islami (Islamic Party of Afghanistan), then led by Maulvi Younis Khalis. Omar is a mystic, affected by his dreams. Yousefzai, said Omar told him "started the Taliban after a dream in which Allah came to him in the shape of a man, asking him to lead the faithful," which led him, in 1996, to declare his leadership. The Taliban had been growing in strength, but were loosely organized. On April 4, 1996, he unsealed a shrine in Kandahar that held a cloak believed to have belonged to the Prophet, the founder of Islam. "The cloak had not been touched since some time in the 1930's. He lifted it in the air as he stood on a rooftop, displaying it to a crowd of followers. The event was caught on videotape, one of the very few times that he was ever photographed. He placed the cloak, which only the Prophet was said to have worn, upon his own shoulders. And at that moment, he declared himself the commander of the faithful, the leader of all Islam. No one had claimed that title since the Fourth Caliph, more than 1,000 years ago." He is not a charismatic speaker, and tends to work in a council; Mullah Wakil Ahmad Muttawakil (often called Mullah Wakil Ahmad), was his chief aide, spokesman, and doorkeeper; he became Taliban foreign minister. Four months after the invasion of Afghanistan started, he surrendered local authorities and was transferred to American custody, where stayed for nearly two years. 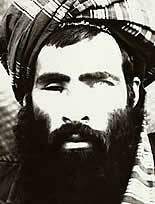 Muttawakil emphasized that while the Taliban brought restrictions, they also brought security. At approximately the same time, Osama bin Laden returned to Afghanistan, met with Omar, provided him with funds, and urged him to spread his vision to the world. Bin Laden had built a fortress-like headquarters for him in Kandahar. After the 9-11 attacks, he was a primary target. Early in the operations, on October 7, an unmanned aerial vehicle spotted what might have been his vehicle; it was attacked by missile and a nearby building bombed. Special Operations Forces (SOF) soldiers attacked Taliban headquarters in Kandahar on October 19-20, 2001. After leaving Kandahar, he was reported to have gone into mountains to the north. There were unconfirmed reports that a July 1, 2002 air raid on a wedding party in Uruzgan Province, where he grew up, were intended to kill him. The bride waswas the niece of Mullah Bradar, a top Taliban official. "Two weeks after that debacle, Omar was spotted northwest of Deh Rawod, in Baghran, looking 'clearly depressed,' according to a senior Afghan intelligence officer in Kabul. Local people told the intelligence officer's agent that Omar had lost family members in the wedding-party bombing." He is believed to be in the Federally Administered Tribal Area of Pakistan. A Pakistani Taliban leader in South Waziristan said they are in close contact. This page was last modified 17:38, 11 June 2009.